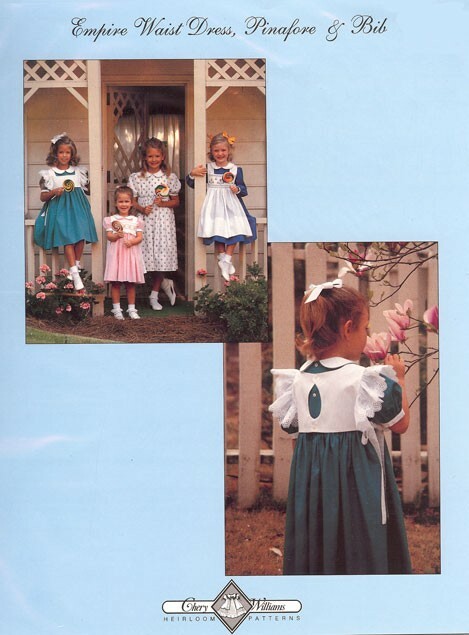 Available size - 3-6 yr.
Raised waisted yoke dress w/short & long banded puff sleeves. Peter Pan collar w/piping. Included is a pinafore & bib pattern. The pinafore can be smocked, if desired as well as the bib. An angel sleeve is included for the pinafore & bib pattern. Pinafore & bib can have solid button back or w/a cut out. Both have side ribbon ties.